Sosaties have been in our food tradition since the days of the Cape of Good Hope, probably brought to the Cape from the island of Java. 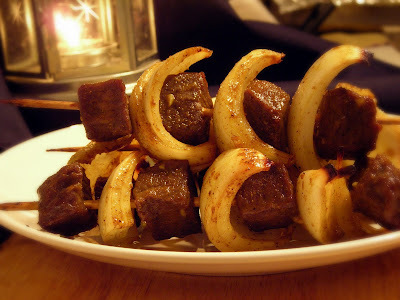 In its most basic form, it is skewered meat, marinated in a curry sauce. Traditionally mutton or lamb is used, but beef, pork and chicken can be used too. They can be cooked in a pan, or in the oven - under the grill. However, most people will cook sosaties over moderate coals as part of a South African braai. Every South African braaier worth their salt has their own recipe, with a little more of "this" and a little less of "that". See what works for you. Combine all the ingredients for the marinade in a pot and add the onion quarters. Cook on low heat, stirring frequently until the spices are combined, the sugar is melted and the marinade thickens slightly. Pour the marinade into a large dish and add the meat cubes. Cover and let the meat marinate in a refrigerator for at least 4 hours, but preferably overnight. Turn the meat a few times. 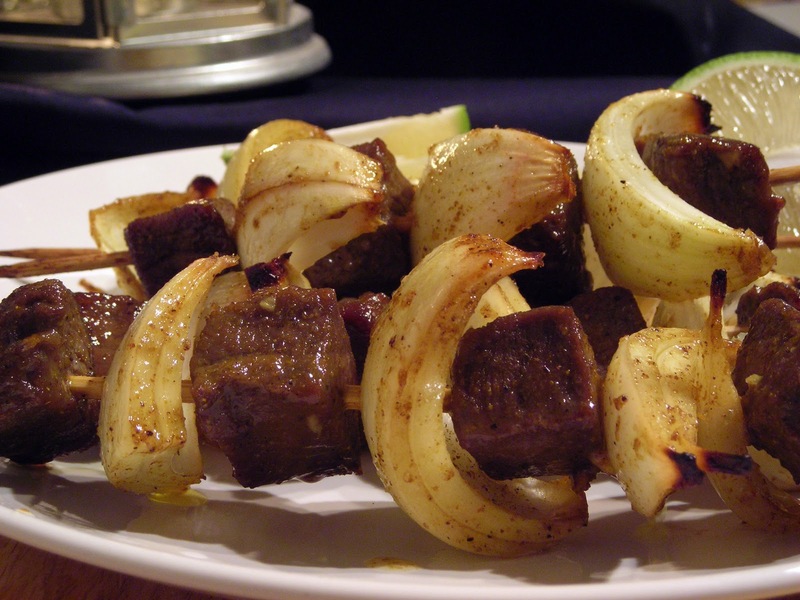 Remove the meat and onions from the marinade and thread onto skewers, alternating the meat and onion with apricots, if using. Braai the sosaties over moderate coals, turning frequently. Alternatively, cook it in the oven under the grill for about 25 minutes or until cooked. Turn frequently. YIKES! I only saw this now because it showed up under your Tamatiebredie post! Regte bazaar sosaties!!! Hahaha! Bazaar sosaties you say? I'll take that as a compliment, Chantelle!